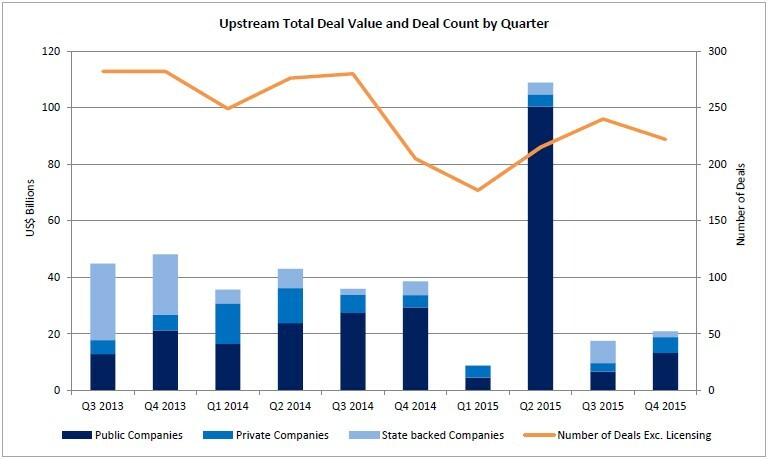 In Q3 2016, there was $24.1 billion of new upstream oil and gas M&A deals, according to Evaluate Energy’s most recent quarterly review of upstream M&A activity. 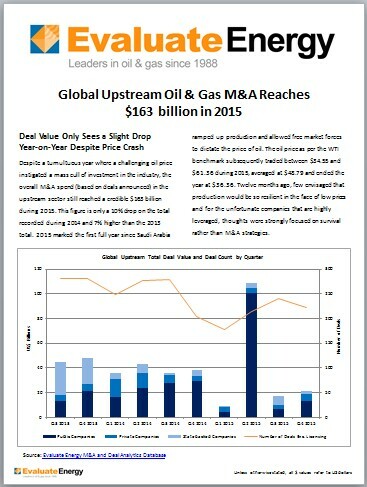 The report, which delves into every major deal around the world in Q3 2016, is available for download now. This quarter’s total deal value falls just short of the $26.5 billion spend in Q2 2016, but marks an increase compared with the $17.7 billion spend in Q3 2015, according to Evaluate Energy’s report. The backdrop for the quarter was of a WTI oil price that averaged $44.74, marginally down on the average of $45.58 during Q2 2016 but with much less volatility; the oil price never breached $50 and only once closed a day lower than $40 in the entire three month period. The Permian basin, economically one of the best in the United States due to its multi-stacked pay zones, attracted 34% of the total spend during the quarter, with 10 of the deals in the basin this quarter being agreed for over $100 million. The Marcellus play, which is proving to be amongst the most economic gas plays in the United States, attracted the largest deal of the quarter when Rice Energy Inc. acquired Vantage Energy LLC for $2.8 billion. As usual, the United States saw the bulk of the deal value, but the biggest Canadian deal of 2016 also took place in Q3 2016, while Statoil ASA agreed a significant deal in Brazil with Petrobras over the Carcara pre-salt oil discovery. 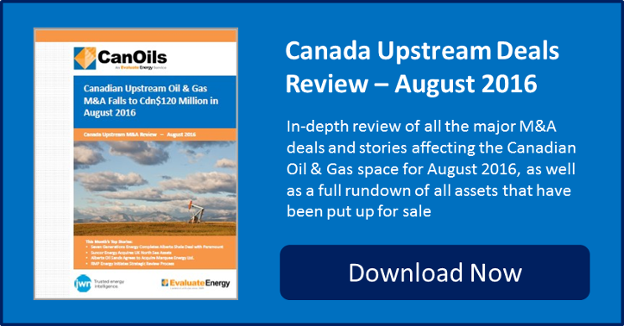 Two Canadian producers are seeking to capitalize on the enduring pulling power of the Montney play by putting assets up for sale, according to CanOils’ newest report focused on M&A activity in August. RMP Energy Inc. (TSX:RMP) and Chinook Energy Inc. (TSX:CKE) have healthy balance sheets and a good inventory of development assets. Both have extensive holdings in the Montney shale. They form the bedrock of the total 12,700 boe/d of publicly disclosed Canadian assets put up for sale in August 2016. The listings follow the recent Cdn$1.9 billion acquisition by Seven Generations Energy Ltd.’s (TSX:VII) of predominantly Montney assets from Paramount Resources Ltd (TSX:POU), which showed Montney assets can still attract strong interest for high value deals. The largest Canadian asset listing in August involved RMP Energy initiating a strategic alternatives process, retaining Scotia Waterous and FirstEnergy Capital Corp. The majority of RMP’s production is derived from the Ante Creek and Waskahigan fields. RMP produces 8,425 boe/d (43% liquids) based on Q2 2016 production figures. The company owns 24.6 million boe of 1P reserves (36% liquids). Chinook Energy Inc. has also initiated a strategic alternatives review and has retained Peters & Co. as its exclusive financial advisor. Chinook is predominantly Montney-focused with 2,890 boe/d of production during Q2 2016 and 12.9 million boe (16% liquids) of 1P reserves. Chinook said it is open to expanding its core operations via acquisitions or by establishing a new core of operations. They will also entertain a merger, sale or JV with a well-capitalized entity to help develop existing assets. 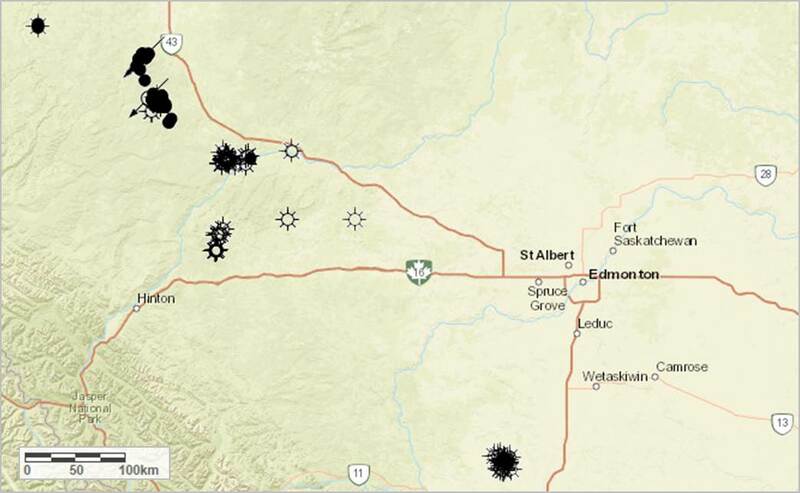 Away from the Montney, August saw Virginia Hills Oil Corp. (TSX-V:VHO) initiate its own strategic review process, while Grant Thornton, in its role as receiver for RedWater Energy Corp., retained CB Securities to advise in the sale of a portion of RedWater’s assets. 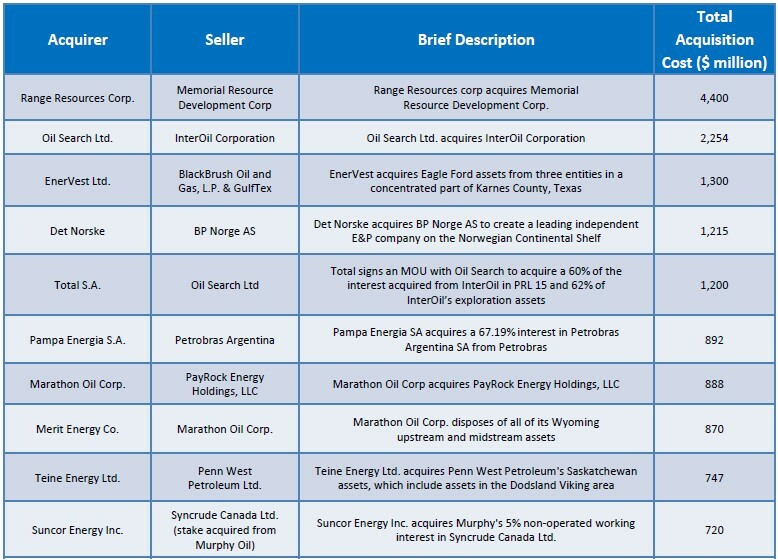 Full details on all of these assets up for sale, as well as a detailed look into all of August’s biggest M&A stories, can be found in CanOils’ latest monthly M&A review of the Canadian E&P industry, which is available for download now. 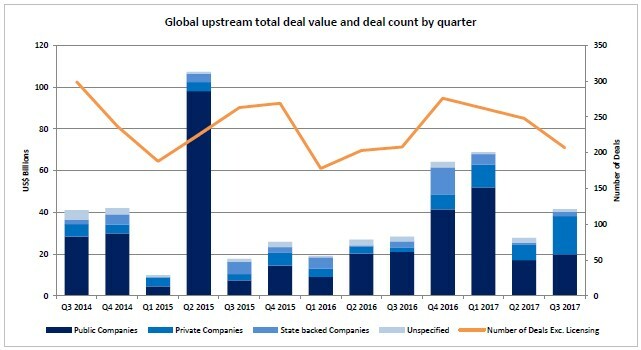 Total global spend on upstream M&A deals rose an encouraging 38% in the second quarter, driven by improved oil prices and market confidence, according to Evaluate Energy’s review of global upstream oil and gas M&A activity in Q2 2016, which can be downloaded now. Oil exceeded $50 a barrel during Q2 – the first time it has done so since July 2015. This is clearly a principal driver of M&A activity; should prices continue to rise, we would anticipate deals to follow. 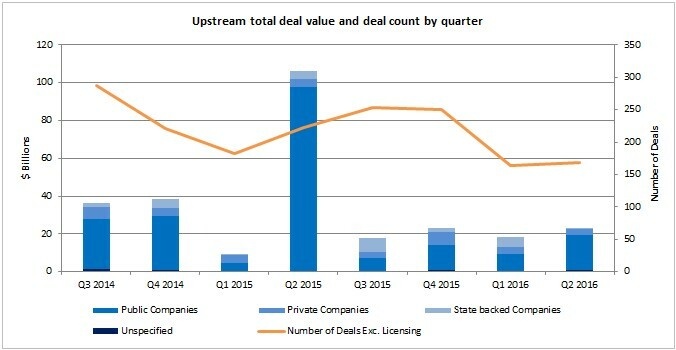 Q2 upstream deals were worth a combined $25.6 billion, according to our latest data, compared to $18.5 billion in Q1. Yes, banks remain wary of over-committing on oil assets, but several companies are acting now rather than waiting for further rises in prices and asset values. Download the full report here for details on all the major deals, the motivation behind them, exclusive analysis and a brief outlook for the rest of 2016.